This month has seen the number of records received by the app overtake the number received by spread sheet for the first time! We’ve also had a great response to Darcy Ogada’s call for help with Cassin’s Hawk Eagle records. New spread sheet data received during September 2014 has kindly been submitted by Andre Botha (533; South Africa), Clive Barlow (96; The Gambia) and Robbie Whytock (41; Cameroon) – thanks very much for this! We’ve also processed the Bateleur data we received from Rick Watson last month which he collected during his PhD. This is the first Bateleur-specific data we’ve received so is great – thanks Rick! The Android app continues to grow from strength to strength. This month has seen another increase in records received via the app to 772 (over double August’s total!) – individual users and their record counts are in the table to the left – a special thanks to Mark Dixon who has surveyed the Garden Route and submitted 18 records of Forest Buzzard! We’ve also seen a rise in the use of survey mode with 50 % of all records created using it. Please see the attached map which shows the density of surveys – a total of 2,922 km have been travelled over 77 hours! 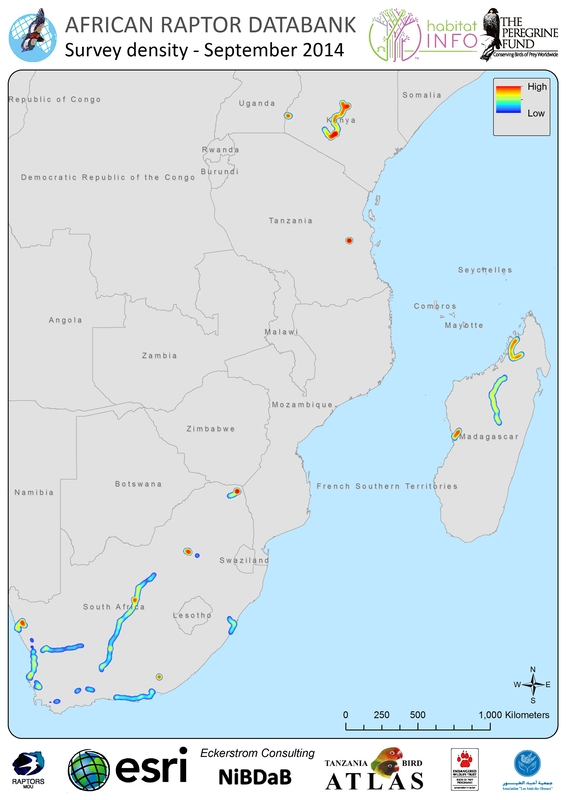 It’s great to see repeat surveys being carried out (red indicates more surveys at a particular location) and further data from Madagascar – thanks Lily! Since Darcy’s call for help with Cassin’s Hawk Eagle data last month we have received 100 more records of this elusive forest eagle bringing the ARDB’s total to 160 (125 recent records and 35 from the Snow Atlas). Special thanks to Marc Languy who contributed 52 records from Cameroon (pending verification) but thanks also to those who e-mailed us with sightings and literature data (a further 27 records). Please continue to send us any additional records! There has been a lot of discussion on the African Raptors list server recently about Yellow-billed and Black Kites! – We’ve attached a map showing the records of these species in the ARDB and are hoping it will prompt you to consider whether we have your records classified correctly. Please get in touch if you think there may be any misclassifications of your data.